“Dear Kurma I was at the temple the other day and the samosas were amazing. What goes into them to make them taste so amazing? Could it be the bhakti, or love and all the ingredients? “Hello Melissa, yes, you are right. 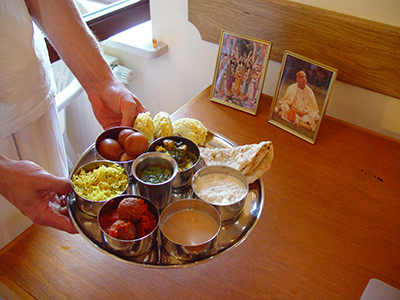 The ingredients have to be just right for any recipe to taste good; but you are correct in your conclusion that if the food (in this case those temple samosas) is prepared with Bhakti (love), then it will have an extra-special flavour that cannot be ascribed to any of the physical ingredients. The consciousness of the cook permeates the food he/she prepares. By way of example: many can recall the delight of eating Mother’s or Grandmother’s cooking, which always tasted special. If they cooked with devotion or love for their family, it was the love that made things taste just that much more flavoursome. So imagine if one can cook for God, and offer it to him with devotion. Of course God does not hunger for our cooking. But He enjoys our love and reciprocates by pervading the food with a special addictive taste. The food becomes a blessed sacrament, and eating that food pervades one’s consciousness with divinity. The art of cooking for God has been perfected in Temples for millenia. The beauty of the process is that it can be even performed at home. Even cooking can be yoga. There are no impediments, and the results are truly spectacular. This is Bhakti Yoga, or connecting with God via loving service.